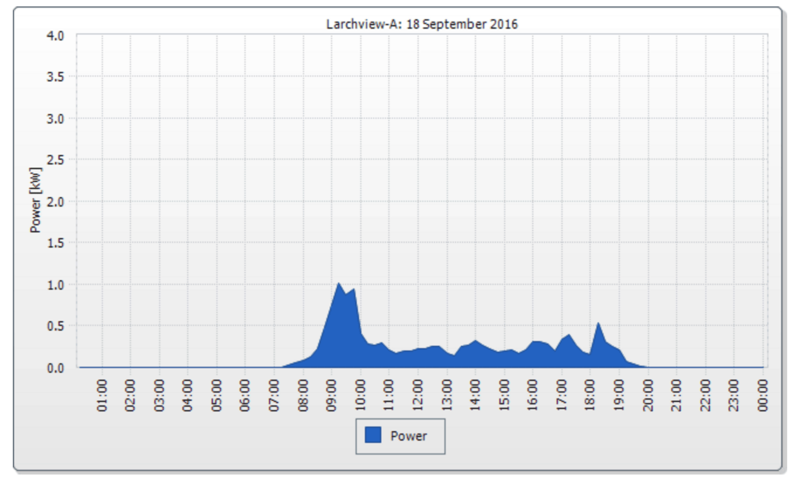 Last month we Installed a 4kW Solar Array at the Automated Home. The first thing everyone asks is how much it cost and what the payback time is. While the finances may not be your only motivation for installing solar they are important and there are several figures that feed into the equation. While some are guesstimates others are more certain. Here are the three main elements of the calculation. England, Scotland and Wales have all had incentives schemes to encourage renewable energy investment (the Republic of Ireland is due to roll out their’s next year). Our similar system uses Northern Ireland Renewable Obligation Certificates or ROC’s for short and is similar to the Feed in Tariff (FIT). The ROC value is currently £0.04. Initially incentive payments were set at a multiplier of 4 ROCs for each unit generated. That multiplier fell to 3 on 1st October 2015 which is the level we’ve got in at, so we get paid 3 x £0.04 = £0.12 for every kWh we generate (and we still get paid for it even when we use the energy ourselves). Our 3 ROC multiplier is guaranteed for the next 20 years while the value of the ROC is set each year by the utility regulator. The money is received in an annual tax-free payout. 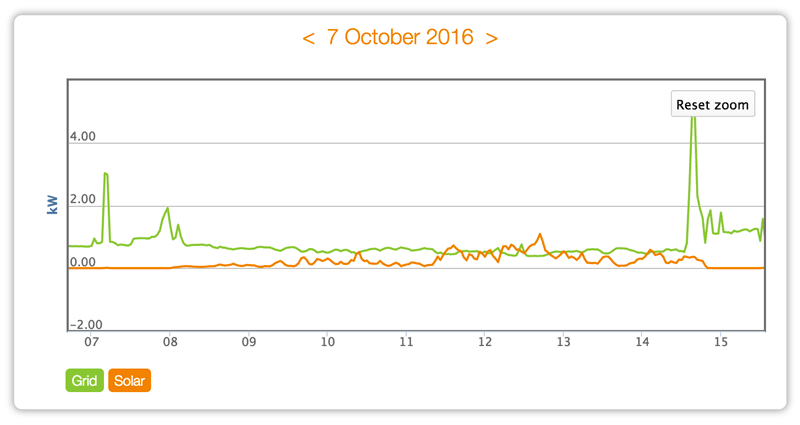 Shortly after we installed our system the multiplier fell to a 2 (from 1st October 2016). Even with the falling incentives the cost of Solar is continuing to fall too so it should still be worth investing in solar over the coming years. Any solar energy that you create and don’t use yourself is exported to the grid. However as we only get a measly £0.03 per kWh, exporting is pretty much the last thing you want to do. The utility companies have a huge backlog fitting export metres so it looks like they’re just going to assume a percentage of total generation is exported (50%?) and pay that out to everyone instead. The unit price is so low though that this still doesn’t contribute much as you’ll see from the sums below. Every unit of electricity you generate and use is one more you don’t have to buy from the grid (currently £0.1343 for us). This is probably the area that’s the most crucial to payback time, but also the most difficult to predict accurately. Your lifestyle may favour this. If someone is at home during the entire day, perhaps a parent with young children, using a washing machine and cooking, watching TV etc then this could be ideal. Alternatively if you live alone and have a long commute that has you leaving home early and arriving back late then you’re unlikely to be able to use the power you’re making. Currently our base line energy usage hovers between 500w and 800w meaning we get the chance to use a lot of energy even when we’re out. But that high base line is not something to be proud of and it’s one of the things we’re tackling in a later part of this review series. I’ve reduced the self-consumption figure from our installation companies illustration from 80% to 70% in the calculations below. Even this may be optimistic with out a battery though. Ideally you would store the energy you make during the peak hours around the middle of the day to use in the evening when everyone is home and energy is in most demand. 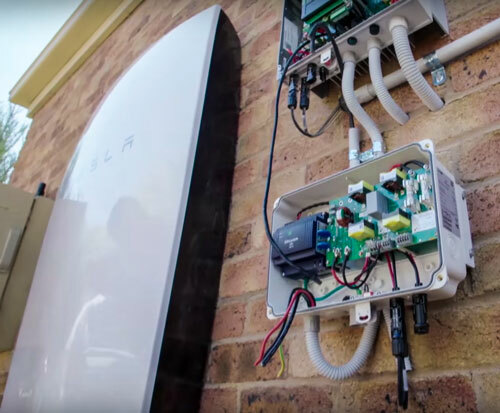 Domestic batteries like the Tesla Powerwall or the Maslow are new and exciting, but they are expensive and pay back times are very long or even well outside the warranty life of the device. Like the rest of the solar technology though, battery prices are falling rapidly. Electric cars on UK roads have risen from 2,000 to 80,000 in the last 5 years and Nissan are working on using their Leaf EV’s batteries for home energy storage too. But while we wait for all this stuff to make more economic sense smart home tech like the SMA Home Manager can be employed to maximise self consumption by starting your most power hungry appliances (like your dishwasher and washing machine) while you’re out. Alternatively one of the easiest options is to divert your un-used energy to the heating of hot water. We’ve fitted the Solar iBoost+ to handle this and we’ll be covering it in detail in a future part of this review series. If you normally heat your domestic hot water (DHW) using your oil fired central heating boiler then there may be a small additional saving to incorporate here. As more of us generate our own electricity the utility companies are bound to start feeling more and more pain. So in future who knows what form electricity bills will take. Power companies will need to raise cash to maintain and upgrade their networks so perhaps there will be higher fixed monthly charges just to connect to the grid, independent of the energy you actually buy from it. But they will have to be careful as this could skew the economics and tip people into going completely off-grid once storage is affordable. While you don’t need sunshine to generate solar energy it sure does help. This graph shows a near-cloudless day in September when the system made over 18 units. We’ve also have some really awful days. This one was just 4 days later and we made a little over 3 units. There should be little or no maintenance with the SolarWorld panels which have a 30 year linear performance warranty. Our system cost £5,000 including VAT and has a predicted annual generation figure of 3,400 kWh, so here are the three inputs into the calculation. If self consumption only reaches say 50% then that would add almost another year onto the payback time. Everything I’ve read says the inverter will need replaced during the lifetime of the panels. Our SMA Sunny Boy unit has a 10 year warranty so lets assume it will need replaced at some point and takes one years income. Years 8 to 20 should be all gravy after that, making us around £10,000. A third decade should be attainable but by then of course the tech will have moved on immeasurably. The sums above also ignoring the inevitable rising cost of electricity. Operators of the controversial Hinkley Point C nuclear plant thats just been given the green light have been guaranteed double the current market price for example. 21 Comments on "Going Solar Part 2 – Costs, Incentives & Payback Time"
@Steve – yes Sunamp covered on latest Fully Charged episode. Mate is fitting one along with a ASHP too. I really, really wanted a Tesla powerwall (battery unit) on the side of my house … until I did the sums. A fully charged powerwall holds around £1 worth of electricity, but it only holds your surplus energy, on a lot of days in the UK there won’t be that much surplus, so maybe it will get fully charged on 200 days, so it can save up to £200 per year, plus some minor amounts on odd days. It currently costs around £5,000 installed, so it will take over 20 years to payback. That is assuming the batteries last 20 years, and don’t need replacing. Not sure how well the batteries would fare over a UK winter, which would leave them fully discharged for several successive weeks. I think that your usage figure of 70% solar is way too high. My wife and I are at home all day and we have an EV. Even by sequencing our charging throughout the day, there is only so much energy that one can use. We average 60 to 65% savings a year. We looked at other clever usage devices but the cost/benefit equation just didn’t stack up. Most households will be using about 25% of any energy that their PV solar array generates. @MichaelD – Yup, that’s the issue currently as I say above. Most of these are first gen products though so they will start to make more sense with time. @Dave Lexden – Thanks for the info. An EV certainly helps things stack up better. I feel at least 50% is achievable for us. If it is 50% not 70% it adds around 11 months to payback time so not that significant. @Chris - Where do you get the 2,800kWh figure from? Thanks. Generation figures are worked out by SolarWorld by post code 3,400 kw hours are the figures for the above post code.If you lived in the south of England the figures would be more if you look at their latest solar farm in America figures would be so much better. Chris we guarantee figures through SolarWorld, not many companies offer this SolarWorld are the only German manufactured panel you can buy with 40 years experience. who knows, every year will be different, every installation will be different … but unless we measure, we won’t know ! I think that energy storage actually leads to an increase in net CO2 emissions. It would be better to export the clean PV energy to the grid during the midday peak demand and peak carbon intensity, and buy the energy back when the gCO2/kWh figure is lower. And if its all about the economics, then a battery still isn’t the right choice! Are there any maintenance costs to take into consideration? Hi Chris – SolarWorld give our customers a free insurance including yield protection, if the above installation does not produce 3,400 kw SolarWorld insurance will make the difference up. If you like I can ask some customers to put their generation figures on here. The Solar Panel Company have customers getting between 3,700 and 4,000 kW on a 4kW system this is a lot higher than your figures. Panel efficiency is getting better as well it’s now between 18% to 20%. Hi Richard – there are no maintenance costs, just a wash once a year panels are self cleaning but we recommend washing them once a year. Thanks Mark, another interesting article, and two good homework videos. With housemove in the offing for us I have to revisit central heating control system and PVs. Looking forward to third part. @Robin – many thanks for that, appreciated. I would recommend throwing that Solar iBoost out and looking to build one or get one that does the instantaneous diversion as can be achieved. The hot water diversion is best done with a hard wired connection with a device that is powered all the time, by the time there is enough energy and the Solar iBoost wireless transmitter tells the base unit that situation might have changed, due to the clouds etc. You want something that can very rapidly change. Look at the OEM project and the DIY diverters on there. They are in a different league compared to the off the shelf products that are made available to people who couldn’t care less. can anybody provide numbers that demonstrate the the economic benefits of the iBoost or any other similar system? I m keen to understand how the numbers work.